As many of you already know, October is breast cancer awareness month, also called Pinktober. At Bit a Bliss, we take cancer very seriously, and do what we can to help those who are in the fight of their life. 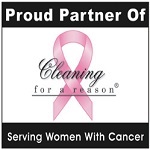 Since 2009, we have been a partner of Cleaning For A Reason, a foundation that helps women battling ANY cancer receive free house cleanings. It has been such an honor working with them, and since we all have been affected by cancer through our families and friends, it is very personal to us and we are proud to be a part of the foundation. Cleaning For A Reason began in 2006 by Debbie Sardone, President of Buckets and Bows Maid Services, Inc. in Lewisville, TX and can boast over a thousand cleaning service partners around the United States and Canada. The foundation recieves applications from patients, and once they are approved, are matched with a cleaning service in their area. The foundation passes the information to the cleaning service, and they contact the patient and set up their free cleanings. Absolutlely no money is required or asked for from the recipient for their services. If you or someone you know could really use housecleaning during this trying time, Apply Here. So this Pinktober, we would like to encourage you to get active in any way you can. Whether it’s donating directly to Cleaning For A Reason (or you could donate to the cleaning service you use that participates, and they will make the donation on your behalf,) or getting the word out, whatever you decide is the right choice. If you enjoy having your home cleaned by a service, we encourage you to use a service that participates in Cleaning For A Reason, to find a service near you, Click Here. Also, take good care of yourself. Many women have no control over whether or not they get cancer, and there is still a long way to go in erradicating it entirely. But there are preventative measures you can take, check out a previous blog of ours on Preventing Breast Cancer.